Russell Jordan and Kailah S. King in Vivian's Music, 1969. Photo by Al Foote III. BOTTOM LINE: A moving pilgrimage of historical repainting, Vivian's Music, 1969 fills in the backstory of Vivian Strong, the 14-year-old African American girl who was shot by a white police officer in Omaha, Nebraska, fifty years ago. On June 24, 1969, Monica Bauer was an adolescent white woman living in Omaha, Nebraska, when a black teenager, 14-year-old Vivian Strong, was shot in the back of the head by a white police officer, prompting riots. Just shy of 50 years later, Bauer’s play Vivian’s Music, 1969, a delicately expressive tribute to Strong’s imagined youth, returns (after a brief run in the "East to Edinburgh" festival) to 59E59 Theaters. With little historical evidence to work with, Bauer has invented for Vivian (Kailah S. King) a father, the fly-by-night jazz drummer Luigi Miller (Russell Jordan), whom Vivian has never met. In this two-person play, directed simply and straightforwardly on a bare stage, save for a chair, by Glory Kadigan, Vivian and Luigi trade off short monologues peppered with early memories and extended impressions of characters who live onstage only as embodied by the vocally versatile pair. Both the monologues and the impressions start out somewhat driftlessly, but Bauer’s writing, and the two central performances, quickly tighten and strengthen as daughter and father accelerate towards each other and towards the jaws of historical inevitability. King’s spirited, thoughtful Vivian radiates with a brilliant smile and childlike gumption. When Vivian recalls her mother’s story of warning about a relative’s lynching fifty years earlier, King simultaneously conveys the physicality and impassioned tone of the mother and, in her terrorized eyes, the child’s reaction. Jordan’s Luigi, who has come back to Omaha to pay taxes on his late mother’s ballroom, amusingly and vividly courts the Polish music store owners on the other side of town into giving him a job as a drums instructor. As written, Luigi’s character flirts with stereotype (he confides, in one unhelpfully excessive detail, that he has impregnated a different girl every time he’s visited home), but Jordan combats this with dry wit and a convincing combination of weary, weather-beaten gruffness and would-be warmth. Once Vivian learns of Luigi’s identity, and their stories begin to wrap around one another, Bauer’s writing takes off as the two strands grow tauter. 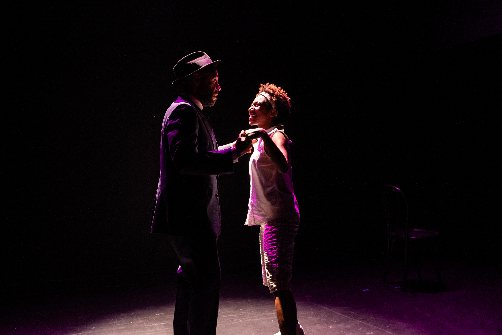 The play’s most compelling character, though, is neither Vivian nor Luigi but Duane, Vivian’s boyfriend, a member of the Black Panther Party who longs to be a professional musician but steps more and more assuredly towards revolution. In a nifty storytelling trick, both Vivian and Luigi bring Duane to life, passing him back and forth between their recollections. Duane’s fierce immaturity in the face of history he senses he must be a part of (“Why can’t I be a Black Panther, and a musician, like, every other week? I could, like, trade off,” he suggests in Luigi’s retelling) is touching and haunting. Bauer’s characters, and her play, have a somewhat uneasy relationship with the possibility of racial integration. The potentially friendly white characters hovering at the play’s periphery, even the Polish jazz accordionist who joins Luigi's combo, all reveal their underlying exoticizing or hostile perspectives by story’s end, yet Bauer—through both Vivian and Luigi—glorifies the racial harmony of the Dave Brubeck Quartet (three white musicians and one black musician in 1969) in a way that comes off more as uncertain inconsistency than intentional complexity. Bauer sometimes also misses out on seizing the opportunities for richer nuance in making these figures’ monologuing voices sharper and more specific: for example, Vivian, momentarily conscious of her own speech, makes an intriguing reference to tensions with a teacher who corrects her grammar, but it never gets explored further. Still, even if the edges are a little ragged, the center of Vivian’s Music, 1969—father and daughter’s fatal collision with history—quivers with well-earned and devastatingly all-too-familiar heartbreak. Vivian's Music, 1969 is by Monica Bauer. Directed by Glory Kadigan. Costume Design by Janet Mervin. Lighting Design by Benjamin Ehrenreich. Sound Design by Andy Evan Cohen. Stage Manager is Maxwell Waters. The cast is Kailah S. King and Russell Jordan.